Today, we wandered around the harbor area in Newport. This is the Pacific Maritime Heritage Center. Admission was $5 but it was a very nice, well done museum. It turns out that the staff person at the desk used to live in Fairbanks and worked at the university. They full-timed in an RV and are thinking about getting an Airstream and continue on. The building has a large venue area upstairs and a new theatre downstairs. 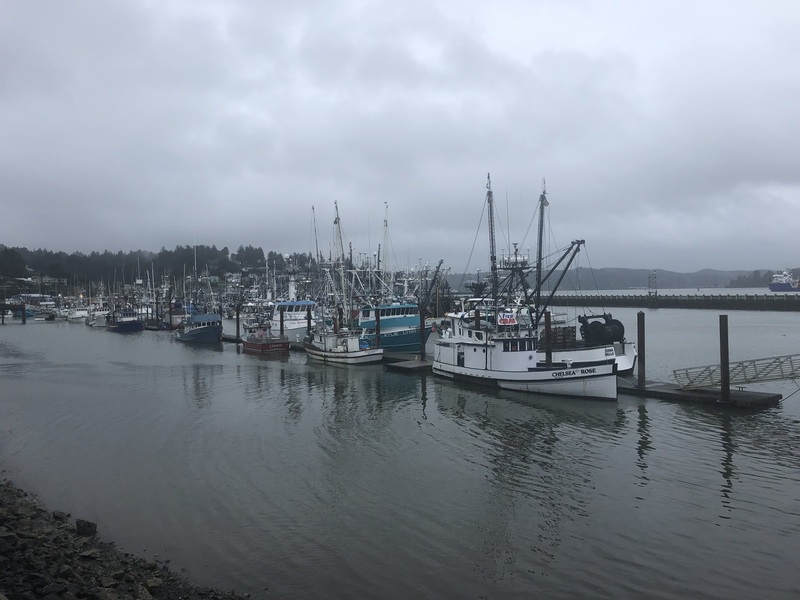 This is just a small part of the fishing fleet based here in Newport. 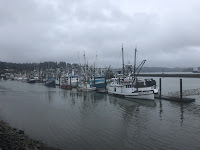 We were parked along the road facing this view while we were at the museum and having a wonderful lunch at Clearwater Restaurant down the road overlooking the sea lion dock. 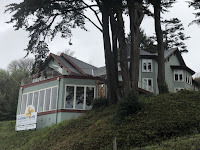 Lunch was clam chowder and a Cobb salad with dungeness crab. Delicious lunch. I don’t think I need to make dinner today. 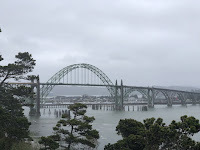 We also went to the Yaquina Bay Lighthouse. 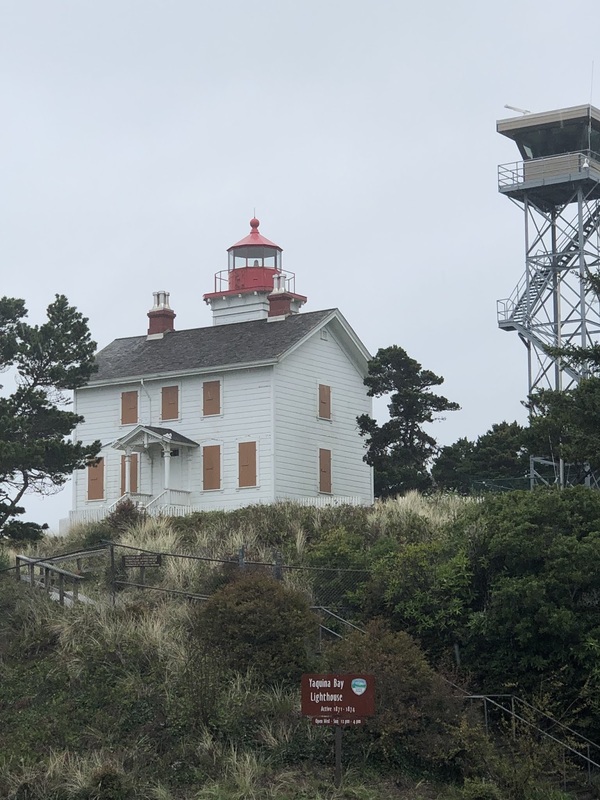 It was only in operation for one year before it was shut down in favor of the much brighter Yaquina Head Lighthouse that we visited yesterday. What is surprising is that the buildings here have been preserved unlike the Yaquina Head buildings. The signs mention several times that the Yaquina Head light has a “first order Fresnel lens”. Which results in a more focused beam. I guess I need to do some research and see what that means. 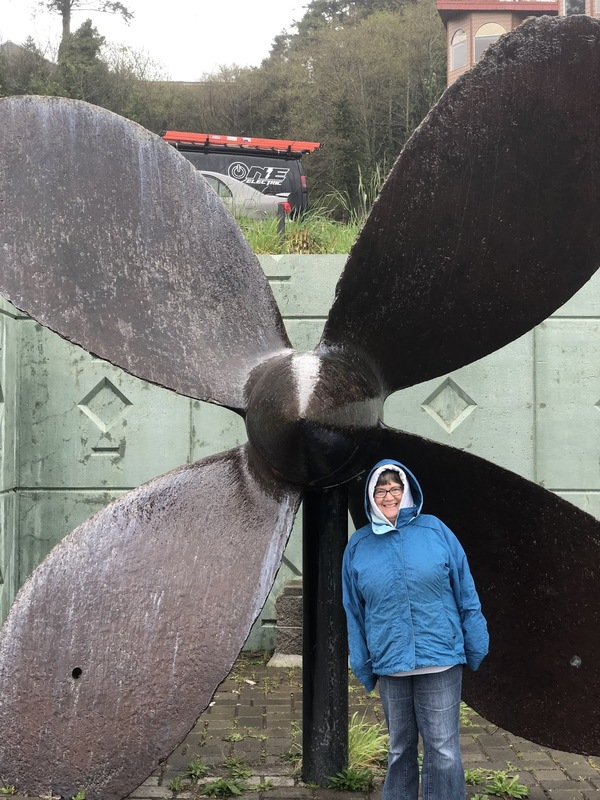 This prop was in front of the Maritime museum without descriptive signage. But it makes for a good picture. 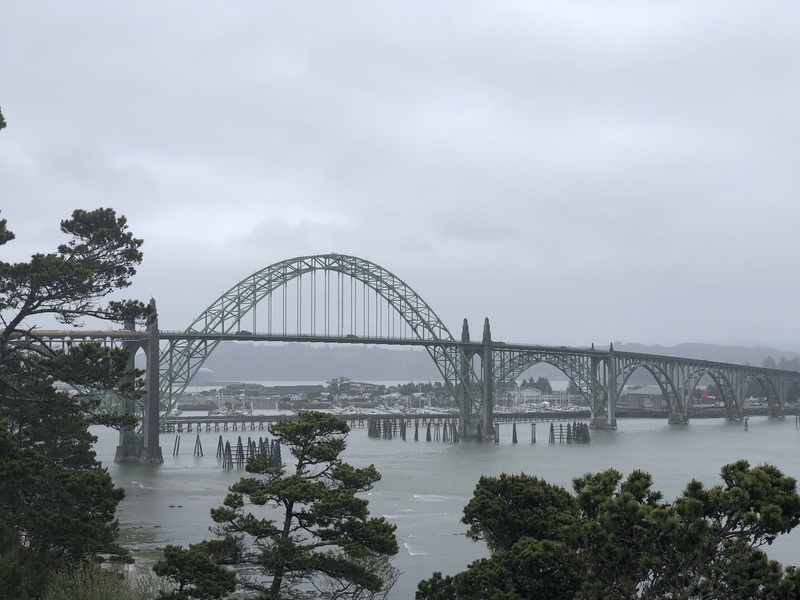 The Yaquina Bay Bridge in Newport has a lot of Art Deco styling cues on the concrete supports. It is almost 2/3 of a mile long and was completed in 1936. Wikipedia says that there are Art Moderne elements on the bridge but I’m not sure what the difference is between the two styles. They didn’t cover that in school. Cool that you're getting your money's worth re the Thousand Trails membership. 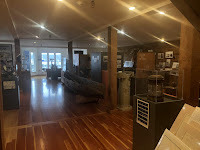 I think I'd like that Maritime Museum, once in a blue moon I fantasize re seeing the world by sailboat but reality soon sets in. I think the TT membership is a bargain. There are a lot of complaints on the Internet but I think that some want resorts and not campgrounds. Sailing used to be something I did and enjoyed. Hey, I recognize those areas. We've been to the lighthouses, but we've never been to the museums. Hopefully your weather is drier today. I don’t expect drier days. We are in Seaside for a several days and I think more rain is in the forecast.